Written by Ruth on July 1st, 2016 July 3rd, 2016 . 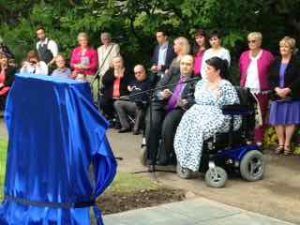 On 30 June, 2016 a ceremony was held in Cathays Park in Cardiff to celebrate the unveiling of the Thalidomide Memorial. The service was held in the presence of HM Lord Lieutenant of South Glamorgan Dr Peter Beck. 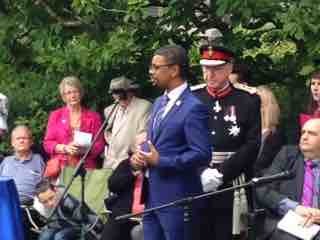 After the introductory speech by Rosaleen Moriarty-Simmonds, Stephen Simmonds explained the significance of the Monument. This was followed with an address by Mr Vaughan Gething, Welsh Government Cabinet Secretary for Health, Well-being and Sport. Harry Freeman, son of the Chair of the Thalidomide Society, Ed Freeman, read out Stephen Simmonds’ moving poem, To Remember is To Care. Prayers of dedication for the memorial were read by the Reverend Canon Robin Morrison immediately after the unveiling of the Monument by Dr Peter Beck. The ceremony began and ended with powerful vocal performances from two students of the Royal Welsh College of Music and Drama – Catrin Raymond and Grace Wyatt. 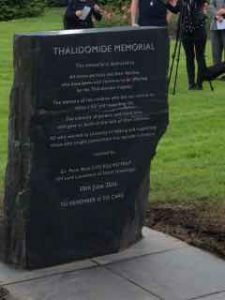 The event was well attended by thalidomide survivors, their friends and families as well as other members of the public. Amongst the notable attendees were Lady Irene Morris, widow of Sir Alf Morris who did so much for the thalidomide cause, and Stephen McGann and Heidi Thomas from Call the Midwife.